← Mom Needs More Care Than You Can Provide – Have You Looked into Granny Pods? Elder Care Bartlett TN – What is Fibromyalgia? According to the Arthritis Foundation, more than 3.7 million people in the United States suffer from fibromyalgia. It’s a complicated disease that causes widespread pain and tenderness. Fibromyalgia can affect people of any age, but most commonly occurs in people between the ages of 40 and 75. It affects more women than men. When an elder family member is diagnosed with fibromyalgia, learning as much as possible about the disease can help you to better support them. Fibromyalgia is a condition that not only causes pain, but also causes fatigue, mood problems, sleep issues, and memory complications. Experts think that fibromyalgia changes the way that the brain interprets pain signals, making them more intense. Some cases of fibromyalgia begin after a trigger event, such as a surgery, infection, injury, or a period of severe stress. However, it can also come on gradually with no identifiable trigger. Genetics: Because fibromyalgia usually occurs in more than one member of a family, doctors think there is a genetic link. Trauma: Psychological or physical trauma may trigger fibromyalgia. Infections: Certain illnesses appear to make fibromyalgia symptoms worse or to trigger the disorder. 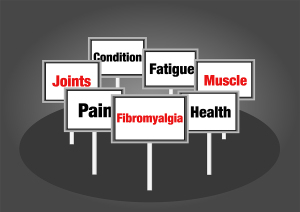 There is no cure for fibromyalgia, but it can be treated. Doctors usually prescribe medications and recommend relaxation techniques, stress reduction, and exercise. Pain: Fibromyalgia pain is most commonly described as “widespread.” It happens on both sides of the body and above and below the waist. The pain is like a dull throb that goes on for three or more months. Sleep Problems: People with fibromyalgia often complain of feeling tired, even right after waking up. Their sleep might be interrupted because of pain. Cognitive Issues: Fibromyalgia can cause people to have trouble focusing. This is sometimes referred to as “fibro fog.” It can make concentrating on tasks hard. Headaches, including migraines and tension headaches. If your senior parent is suffering from fibromyalgia, hiring an elder care professional provide in-home care can help manage the condition. An elder care professional can assist with tasks around the house that might be difficult because of fibromyalgia pain. They can also remind your parent to take prescribed medications. Elder care professionals can even drive your parent to medical appointments. For Elder Care Services in Bartlett TN, please contact the caring staff at Personal Care Services MidSouth today! This entry was posted in Challenging Diseases/illnesses/Conditions, Elder Care Bartlett TN and tagged Elder Care Bartlett TN. Bookmark the permalink.